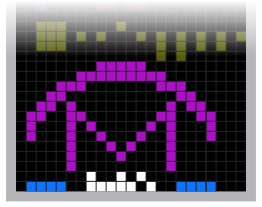 The Arecibo message is a 1974 interstellar radio message carrying basic information about humanity and Earth sent to globular star cluster M13 in the hope that extraterrestrial intelligence might receive and decipher it. The message was broadcast into space a single time via frequency modulated radio waves at a ceremony to mark the remodeling of the Arecibo radio telescope in Puerto Rico on 16 November 1974. The message was aimed at the current location of M13 some 25,000 light years away because M13 was a large and close collection of stars that was available in the sky at the time and place of the ceremony. The message consisted of 1,679 binary digits, approximately 210 bytes, transmitted at a frequency of 2,380 MHz and modulated by shifting the frequency by 10 Hz, with a power of 450 kW. The "ones" and "zeros" were transmitted by frequency shifting at the rate of 10 bits per second. The total broadcast was less than three minutes. The number 1,679 was chosen because it is a semiprime (the product of two prime numbers), to be arranged rectangularly as 73 rows by 23 columns. The alternative arrangement, 23 rows by 73 columns, produces an unintelligible set of characters (as do all other X/Y formats). The message forms the image shown here when translated into graphics, characters, and spaces. On 16 November 2018, Google released a Doodle to commemorate the 44th anniversary of the transmission. The numbers from 1 to 10 appear in binary format (the bottom row marks the beginning of each number). Even assuming that recipients would recognize binary, the encoding of the numbers may not be immediately obvious because of the way they have been written. To read the first seven digits, ignore the bottom row, and read them as three binary digits from top to bottom, with the top digit being the most significant. The readings for 8, 9 and 10 are a little different, as they have been given an additional column next to the first (to the right in the image). This is intended to show that numbers too large to fit in a single column can be written in several contiguous ones, where the additional columns do not have the least-significant-digit marker. The numbers 1, 6, 7, 8, and 15 appear. These are the atomic numbers of hydrogen (H), carbon (C), nitrogen (N), oxygen (O), and phosphorus (P), the components of DNA. The nucleotides are described as sequences of the five atoms that appear on the preceding line. Each sequence represents the molecular formula of the nucleotide as incorporated into DNA (as opposed to the free form of the nucleotide). i.e., 7 atoms of hydrogen, 5 atoms of carbon, 0 atoms of nitrogen, 1 atom of oxygen, and 0 atoms of phosphorus. DNA double helix; the vertical bar represents the number of nucleotides. The value depicted is around 4.3 billion, which was believed to be the case in 1974 when the message was transmitted. It is currently thought that there are about 3.2 billion base pairs in the human genome. The element in the center represents a human. The element on the left (in the image) indicates the average height of an adult male: 1.764 m (5 ft 9.4 in). This corresponds to the horizontally written binary 14 multiplied by the wavelength of the message (126 mm). The element on the right depicts the size of human population in 1974, around 4.3 billion (which, coincidentally, is within 0.1% of the number of DNA nucleotides). In this case, the number is oriented in the data horizontally rather than vertically. The least-significant-digit marker is in the upper left in the image, with bits going to the right and more significant digits below. The Earth is the third planet from the Sun; its graphic is shifted up to identify it as the planet from which the signal was sent. Additionally, the human figure is shown just above the Earth graphic. 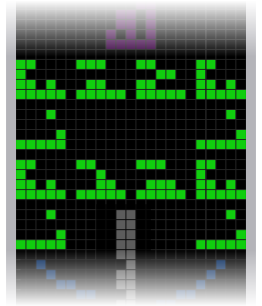 The Arecibo message as decoded into 23 rows and 73 columns. Although unintelligible, the message in this format appears sufficiently organized to show that it is not a random signal. The last part represents the Arecibo radio telescope with its diameter: 2,430 multiplied by the wavelength gives 306.18 m (1,004 ft 6 in). In this case, the number is oriented horizontally, with the least-significant-digit marker to the lower right in the image. The part of the image that looks like a letter "M" is there to demonstrate to the reader of the message that the curved line is a paraboloid mirror. ^ a b c d e "Cornell News: It's the 25th anniversary of Earth's first (and only) attempt to phone E.T." Nov 12, 1999. Archived from the original on 2008-08-02. Retrieved 2008-03-29. ^ Johnson, Steven (28 June 2017). "Greetings, E.T. (Please Don't Murder Us.)". The New York Times. Retrieved 28 June 2017. ^ Larry Klaes (2005-11-30). "Making Contact". Ithaca Times. Archived from the original on 2009-01-07. Retrieved 2007-07-27. ^ Jay M. Pasachoff. "Chapter 20: Life in the Universe". Williams.edu. Retrieved 2007-05-05. ^ Walker, John. 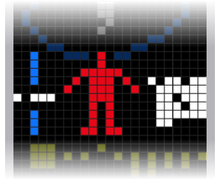 "Self-Decoding Messages - The Arecibo Message". bibliotecapleyades.net. Retrieved 15 November 2018. ^ a b Cassiday, George. 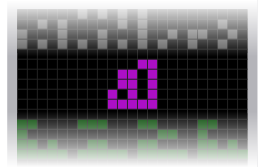 "The Arecibo Message". Retrieved 12 Oct 2013. ^ Dave Deamer (December 4, 2009). "In regard to the email from". Science 2.0. ^ "44th Anniversary of Arecibo Message #GoogleDoodle". Google. 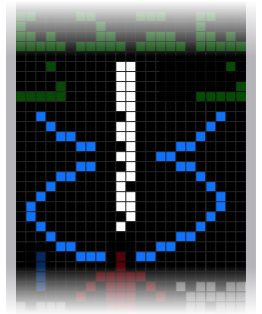 Wikimedia Commons has media related to Arecibo message. This page was last edited on 4 April 2019, at 13:51 (UTC).